In 1865 the British government launched an inquiry into claims that mysterious lights had lured dozens of ships to destruction on the coast of north-east England. DAVID CLARKE opens the files on a 145-year-old mystery. For much of the 19th century, a ten mile stretch of the rocky Durham coastline between the rivers Wear and Tyne was notorious as a graveyard for shipping. From the 1860s more than 160 vessels were wrecked after running aground on submerged rocks between Marsden and the village of Whitburn just a mile from the shore. The hazardous reputation of Whitburn Steel, as the rocks are known, worsened during the Industrial Revolution. Bulk cargo such as coal and iron ore were more easily moved by sea than rail and the demands of heavy industry in Tyneside led to a dramatic increase in coastal shipping. Smoke pollution from industrial cities like Sunderland added to the problems faced by vessels that hugged the coastline as they approached Tyneside from the North Sea. These facts are not disputed but the bizarre circumstances surrounding the sharp spike in the number of shipwrecks have now faded from living memory. The National Trust guidebook to the coast – now a Nature Reserve – mentions rumours of “local people luring ships onto the rocks with false lights in order to plunder their cargoes” (1). But no reference is made to the fear and anger which gripped fishing communities as losses mounted and suspicions grew. Between 1864 and 1870 wrecks became a regular occurrence every winter. For example, on the night of 24 November 1865 the schooner Test came ashore as it followed the coast towards the Tyne. Fortunately, its entire crew were rescued by the Whitburn lifeboat that was manned by fishermen from the village. Afterwards Captain Jerome Major testified that all was well until he saw two bright lights in the sky that he wrongly identified as the lighthouse at the mouth of the Tyne. As he approached the lights he realised his vessel was closing rapidly on the shore, but it was too late to turn around. The Test struck Whitburn Steel and was wrecked. A steam tug and a brig met the same fate before the end of the same year and a number of others had a narrow escape. By December losses became so severe that a group of sea pilots and fishermen demanded an official investigation. Their petition reached North Durham MP Sir Hedworth Williamson who tabled a Parliamentary Question to the Board of Trade. In the Commons he asked if the government were aware of the rumours concerning “false lights” on the Durham coast or that 17 vessels had been lost on the rocks near Whitburn in one five month period since September 1864. Pressure increased on the authorities to act and in December 1865 the Board of Trade asked Trinity House, the body responsible for the safety of shipping since the days of Henry VIII, to investigate. Shortly before Christmas 1865 a commission of elder brethren led by Rear Admiral Sir Richard Collinson (1811-1883), left London. On arrival in Sunderland the commission visited the coastguard station where officers described their own observations of a mysterious light above the coast during the winter months. After dark the officers visited the fishermen’s cottages at Whitburn to inspect a new gasworks and an optician’s workshop whose windows faced the sea to the south and east. Both were initially suspects but the investigation quickly ruled these out as sources for the lights. On Thursday 28 December the Board of Trade inquiry opened in Sunderland’s Custom House. During the day’s proceedings the commission took statements from coastguards, ship’s pilots, fishermen and local residents. By a stroke of luck the complete proceedings have survived in a file preserved at The National Archives. This contains summaries both of the evidence transcribed in longhand and copies of depositions and correspondence with Trinity House (2). One of the first witnesses examined by the commission was coastguard Frank Mills. He described seeing two strange flashing lights in a field southeast of Whitburn at 3 AM one morning early in December. Mills said: “They appeared about 12 or 14 feet apart [and] I am certain they were not on the sea. They looked like bright lanterns. I made towards them – but they disappeared almost directly.” Robert Morrison, master of the docks at Sunderland, testified that he often patrolled the north pier at night. During a three year period he had seen a bright revolving light to the northeast over the coast at Whitburn, usually in the early hours of the morning. In their summing up, the commission decided there was “no truth” in the rumour that false lights had been deliberately lit by anyone who could profit from the wrecks. In the case of the lost ships, human error was blamed, as the crews “did not pay sufficient attention to the course steered which they ought to have done in running along the coast in thick weather.” But as doubt remained as to the source of the lights, the inquiry asked the Tyne Pilotage Board to make further investigations. During proceedings in January 1866 the board took further evidence from eyewitnesses who had seen mysterious lights over the Durham coast. These included Thomas Tynemouth who saw a bright revolving light moving west, “considerably elevated above the land” to the north of Souter Point on 22 December. He said it was a rocky and desolate area with no dwellings nearby (3). A Board of Trade official described the accumulated evidence as “very mysterious” and ordered police and coastguards to keep a look out for any evidence of criminal activity. As public excitement grew one foggy night in November 1866 the 417 ton bark Margaret and Jane struck the rocks just south of its home port of South Shields. The crew of eight were rescued by the lifeboat and revealed their ship had been led directly onto the rocks by a bright light on the Whitburn coast. Giving evidence at a court of inquiry at South Shields police court in 1867, boatswain John Frater said he sighted land at 4 AM when 21 miles south of Tynemouth whereupon a crew member called out: ‘There’s the bonny light!’, pointing to the sky above the ship’s mast. Although visibility was poor all the crew then clearly saw a bright revolving light. Immediately the captain turned the ship northeast towards what they believed was Tynemouth castle beacon, six or seven miles distant. Within minutes a ripple appeared in the water indicating they were on the rocks. At this hearing, a group of veteran sea pilots told the court they had seen, from the mouth of the Wear at Sunderland “a glare or reflection of a lofty light at the entrance to the Tyne… in some states of the atmosphere over the high land of Souter Point.” They believed this was the explanation for “the false lights” that had lured vessels to their doom. They said the reflection would not fool experienced crews but was a clear hazard to strangers. Having decided human error caused the loss of the Margaret and Jane, the court sent “a special report” to the Board of Trade (4). In 1869 a further 20 vessels were lost on Whitburn Steel and it was evident that something had to be done. In response to petitions from the fishermen and the reports from the Tyne Pilotage Board and Shields Police Court, Trinity House bowed to pressure and commissioned a new lighthouse. The Souter Point light is unique in the British Isles – and possibly the world – as the only lighthouse originally constructed to warn seafarers of a hazard caused by unexplained aerial phenomena or UAP in modern terminology. The building which houses the beacon was constructed on a high point north of Souter Point by James Douglass, Chief Engineer to Trinity House, and was the first in Britain powered by electrical alternators. Opened in January 1871, the tower stood 345 yards from the cliff edge and a foghorn was added to provide a further warning to shipping in poor weather. In addition to the revolving beacon light visible from the sea, a series of prisms was used to reflect a red beam inland over Sunderland Bay. This invention meant that vessels which strayed too close to the coast were alerted to the dangers by a flashing red beacon. When the beacon changed to white it indicated they had steered towards safer waters in the North Sea (7). The opening of Souter lighthouse exorcised the “false lights” which were never seen or reported again, as far as I have been able to ascertain. Were these mysterious lights really caused by reflections of the Tynemouth beacon in unusual weather conditions as experienced mariners believed? Were they lit deliberately by persons unknown to lure ships and their cargoes onto the rocks as many appear to have suspected at the time? Or is it possible these were 19th century examples of what we would today call “earthlights”, ‘unidentified aerial phenomena’ or UFOs? Could there be another explanation? Phantom lights appear to have some direct link with the location where they are seen, especially those repeatedly seen over lengthy periods of time. Famous examples include the Marfa lights of Texas and those recorded at the Hessdalen valley in Norway. As Charles Fort noted in his account of the “false lights of Durham” there are other cases where intense outbreaks of sightings occur over months or years, after which there is no further recurrence (8). Today Forteans and UFOlogists describe this type of event as a “flap”. 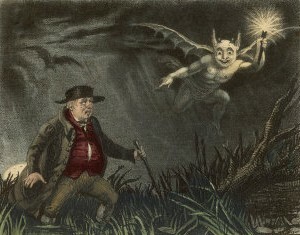 Descriptions of the “false lights” of Durham resemble accounts of the will o’the wisp, Jack o’Lantern or ignis fatuus (‘foolish fire’) of folklore. This phenomenon, usually associated with boggy inland areas, was often described as a playful, moving light or group of lights. Others have described a fixed flickering flame. Eyewitnesses who have approached this type of phantom light frequently comment upon their evasive or intelligent behaviour. Sometimes they appear to recede into the distance or vanish like a mirage as attempts are made to capture or surround them (9). The sea pilots who testified before the court of inquiry in 1865-66 said the Durham lights behaved in a similar manner. They appeared most frequently in hazy or foggy weather and when mariners approached Whitburn Steel the lights vanished. As they steered away, the lights reappeared. It is also instructive to compare the Durham phenomena with the accounts given by the airmen at RAF Woodbridge in Suffolk who reported pursuing mysterious lights through Rendlesham Forest in 1980 (FT 204:32-39). Their original accounts describe following a light or lights among the trees that moved away at they walked towards what they came to believe was a UFO. Eventually, they realised at least one of the mysterious lights was the flashing beacon of the Orfordness lighthouse, six miles away on the coast. In 1999 Inspector Mike Topliss of Suffolk Police said his officers were familiar with the fact that Rendlesham forest was swept by powerful light beams from Orfordness. Echoing the comments of the Sunderland sea pilots, he added: “I know from personal experience that at night, in certain weather and cloud conditions, these beams were very pronounced and certainly caused strange visual effects” (10). Writing in 1986, researcher Phil Reeder said it was curious that sightings of Will o’the Wisp had become virtually exinct towards the end of the 19th century (11). The reason why few people report such lights today is because they have been replaced by sightings of UFOs. True or false, Will o’the Wisps are notorious for leading people astray. Although the true nature of these lights remains a mystery it is clear to me that at least some experiencers may be describing a similar phenomena and if so, they may have a common source. “….Hi David, I was reading your article about the false lights of Durham and I think my experience on September 5th, 2011 at 10pm somewhat mirrors what was reported by some witnesses many years ago. I live in South Shields and often walk my dog at night around the old quarry and south shields golf course which are only several hundred yards away from Souter light house and are the highest points for several miles giving a good view of the area. After taking some shots of the town lights with my canon dslr…I had sat down on a wooden seat above the cliffs of Marsden old quarry which overlooks the whole town and as i was taking in the view I noticed very high in the sky 1 flashing white light…It struck me as odd because i could not see any red,green navigation lights . There’s always lots off air traffic back and forth from Newcastle airport so I am familiar with aircraft at night. I watched it descend to to a fairly low height in the distance over the ocean. It was now a stationary flashing white light and was shortly joined by another identical white flashing light which came from the distance from an easterly direction at speed and stopped right next to the first. They seemed to be going back and forth,blinking and overlapping each other. It was strange, I had never seen anything like it,i thought it was a military exercise ,helicopters -and thought to myself the pilots must be crazy flying so close to each other without the usual navigation lights on. I turned to head home and took a detour over the golf course as i so often do,and I had perhaps walked 20 yards on the golf course when i looked behind me and to the left, one of the flashing white lights was suddenly getting nearer at a high rate of speed. Within seconds it was parallel to me and flashing a brilliant white light. It was perhaps a couple of hundred feet in height and totally silent,probably about 3 or 400 yards away at first ,travelling in line with the coast line. It seemed to release its light from within itself with a burst,as though it was radiating from the actual object. As I quickly removed my camera from the rucksack the object seemed to go wild.It began constantly changing direction,left, right ,near,far. Flashing all the time.It would often double back on its self and at times it would be miles away. Literally a tiny flashing speck bouncing about on the far horizon and then it would be quite close again in an instant. On a couple of occasions it actually got behind me and actually lit the ground close to me,like a camera flash,i was absolutely scared witless. Trying to follow it it with the camera felt like an impossible task,it never moved in a linear fashion like a normal aircraft and i just kept my finger on the shutter button and tried to follow it the best i could.Out of about 150 shots it only showed on a few. i was actually surprised i even got anything.I didn’t find out until I checked the pics at home. I also got a short video clip of it as it was departing in the direction of Whitburn, Sunderland. The speed this thing was moving and its behaviour are impossible. The whole thing was very surreal . I certainly don’t believe in extra terrestrials but i guess this would come under UFO sighting. I should also mention the object seemed quite small,perhaps a meter or 2 in size. Also the wind was blowing from the south west and this eventually left in a southerly direction. I am convinced there are phenomenon which are native to our planet which periodically appear in the air and are not understood due to our scientific limitations. Oliver Garnett, Souter Lighthouse guidebook, published by The National Trust (1995). Marsden rocks north of Whitburn were a favourite haunt of smugglers including ‘Jack the Blaster’ who set up home here with his wife in 1782. But by 1850 the village the coastline was protected by coastguard stations and patrolled by police. The National Archives, Board of Trade file MT 9/28 – False Lights, Whitburn. Crown Copyright. Testimony heard by the commission was widely reported by the regional and national newspapers, including the Northern Express, Newcastle Courant and London Times. The Times, 9 January 1866. The Times, 31 December 1865 and 2 January 1866. The Times, 1 & 15 January 1868. Souter Lighthouse guidebook. Trinity House closed the lighthouse in 1988 as a result of the decline in coastal shipping. Today it is in the care of the National Trust and the building and grounds are open to visitors. Fort, The Book of the Damned (1919), chapter 25. Letter dated 28 July 1999 reproduced in Georgina Bruni, You Can’t Tell the People, Sidgwick & Jackson, 2001. Northern Earth Mysteries 30 (spring 1986). I live in Tynemouth and on Sunday 16th August 2015 between 2 and 5am I witnessed these lights! I also saw a transparent shape around the lights at times that seemed to be pulsating. Upon closer inspection it seemed as though the main lights were in the centre of a huge disc which was made up of these cloud like transparent shapes. These shapes looked like cloud but pulsated and were in the same disc shape all night. Sometimes they had a flicker but the lights mainly remained in the centre where they darted about at great speed changed direction and also formed a line at one point. It has completely changed my view on everything! I will keep looking and try to see it again !